Professional handlebar ribbon. From Deda Elementi. Soft touch foam with great grip, helps absorb the worst shocks and vibration. With a great look and a soft feel its ideal for adding the finishing touches to that dream bike! Can cover any type of bar extension. 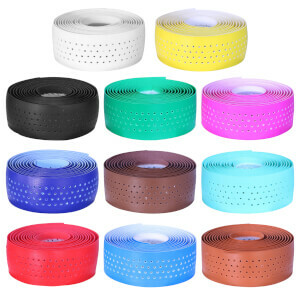 Pack includes: Adhesive backed foam bar tape, bar end plugs, finishing tape and extra tape for brake lever area. A good tip for fitting new tape: put the box on top of a radiator for a few minutes first. This makes it nice and pliable and makes for a neater job! 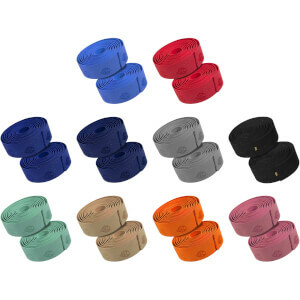 For the best fitting instructions available see our Handlebar Tape Fitting DVD. Step-by-step instructional DVD with clear close-up shots showing exactly how to fit bar tape. Good tape, good colors, but the length is too short; had to overstretch and re-wrap to get it to cover (with subsequent loss of cushioning). Not enought resistant when I applied it on the handlebar. Bought this tape to re-tape my aero and break bars to match my Garneau Tri bike. Tape works fantastically - grip is softer than my stock tape and (to this point) I would say that I wont have to re-tape for a while (I bought around 5/1/2018). Only think I would say is that I would recommend using electrical tape instead of the Deda tape provided. 5/5 otherwise. Simple, but does the job and does it well. Always run this on my bike, have tried all kinds of other 'new' tapes, but keep coming back to this. Wow.. not even close to the color that was shown. Totally wasted my money. I feel like the product I received was a very old stock. The adhesive came off while peeling the strip. The tape was fragile, it ripped pretty easily. They seem to have colors no one else has. 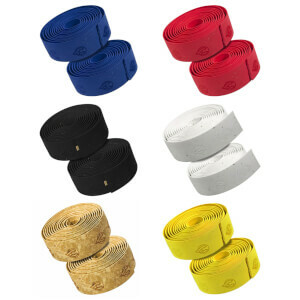 The price is right and the handlebar tape seems as good as the high price brands. I would recommend it again. 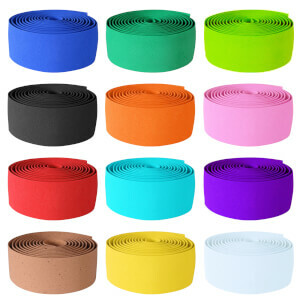 Everything you don't want in handlebar tape. So short it barely wraps a 40cm bar. Even with the minute amount of overlap necessary to wrap this short bar the tape ends up thin and hard. The finish is also very slippery so I guess it is designed for people with 36cm bars, who wear gloves and have a pro to wrap their tape for them. Even doing multiple wraps a week/day in my workshop I felt like this might snap in places. Gutted I bought 2 packs is the summary. 1 is in the drawer, the other in the bin as my customer got me to remove it again and fit a synthetic cork. I like the way the tape feels. IT is a good compromise between low cushion and high cushion. Looks good as well. The end plugs are pretty low quality. I use 44 cm handlebars. If you overlap as recommended, there won't be enough tape to cover the handlebar. In the past, I've always used SRAM supercork tape, and there was plenty of tape left over. I tried the Deda because it was rated as not so "cushiony" - and I agree. However, there also isn't enough product in the box to do a complete set of large handlebars. Better than expected. the slightly extra width makes a huge difference in application. Colour selection is also wider than much of the competition. The silver rolls look good on my vintage Araya aero 821.